The Birmingham metropolitan area, sometimes known as Greater Birmingham, is a metropolitan area in central Alabama centered on Birmingham, Alabama. As of 2013, the federal government defines the Birmingham-Hoover, AL Metropolitan Statistical Area as consisting of seven counties (Bibb, Blount, Chilton, Jefferson, St. Clair, Shelby, and Walker) centered on Birmingham. The population of this metropolitan statistical area as of the 2010 census was 1,130,047, making it the 49th largest metropolitan statistical area in the United States as of that date. According to the United States Census 2013 estimate, the metro area has a population of 1,140,300. The seven counties in the Birmingham–Hoover metropolitan statistical area are combined with the Cullman micropolitan area (Cullman County) and the Talladega-Sylacauga micropolitan area (Talladega County and Coosa County) to form the federally defined Birmingham-Hoover-Talladega, AL Combined Statistical Area. According to the United States Census 2013 estimate, the combined statistical area has a population of 1,313,105. It is the 42nd largest population sub-region in the United States, and the largest population region in Alabama, constituting roughly 1/4 of the state's population. Nearby counties Tuscaloosa, Etowah, and Calhoun, while not officially a part of Greater Birmingham, contribute significantly to the region's economy. Four U.S. highways, US-31, US-11, US-78, and US-280, run through Greater Birmingham. US-31 parallels Interstate 65 for its entire route, including Greater Birmingham. US-280 runs southeast of the city, connecting it with Auburn and Auburn University. The corridor through suburban Birmingham is notorious for its severe congestion as it carries about 200% of its traffic capacity. US-31 and 280 merge in Homewood to form the Elton B. Stephens Expressway. This expressway goes through a geologic cut through Red Mountain, connecting downtown Birmingham to its southern suburbs. US-78 parallels Interstate 22 to the northwest of Birmingham, and Interstate 20 to the east. US-11 parallels Interstate 59 for its entire route. All four of these highways meet in downtown Birmingham. Birmingham received $87 million from the US Congress to help fund a regional transportation system. However, no progress has been made. The only form of regional mass transit is the Birmingham-Jefferson County Transit Authority (BJCTA) bus system, which has been severely underfunded. Birmingham ranks as one of the top automobile cities, and routinely fails EPA air quality standards. Greater Birmingham is served by the Birmingham-Shuttlesworth International Airport, with service by American Airlines, American Eagle, Southwest, United, and Delta. Many Birmingham air travelers make the trip to nearby Atlanta Hartsfield-Jackson International Airport, the busiest airport in the World. There have been proposals to build a major international airport in the Greater Birmingham area to serve as a relief airport for Atlanta, but no official plans have been made. 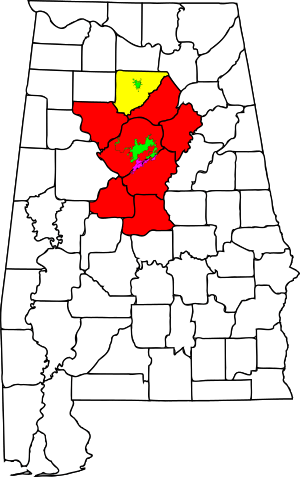 Birmingham metropolitan area, Alabama Facts for Kids. Kiddle Encyclopedia.